I have no idea where the manta ray thing came from, but it seems like a logical leap. They look like they could fly pretty fast, right? My partner and I talked through the first iteration: a reverse runner in a fixed lane moving toward the horizon, constantly speeding up as you dodge or shoot at bad things and use the water as drag for slowing yourself down (suitable for the “Beneath the Surface” theme). My personal goals were for this to be both a learning process and a test of whether Zite and I could reasonably work together. The two of us settled on a first iteration and got to work. Virtually everything game-related I’ve done has been in 2D, so this necessitated me learning how to model, rig and animate in Blender right off the bat as fast as possible. Zite stayed up all of Friday to build out the first working prototype, I spent most of the first 24 hrs editing the manta ray model heavily and then learning how to rig from scratch. We reconvened after the prototype was done to talk about what was working and what wasn’t in terms of the camera view, where and how the laser was firing — leave all that graphics stuff for later because that stuff doesn’t matter if the game doesn’t fundamentally work. Sleep deprivation began to set in and design decisions came down to whether it passed the “does it sound like a good idea?” test. I made a list of all the features we talked about and culled the nice-to-haves from the core functionality. Our priorities: character attacks, enemies, the Octopod boss, and whether it would port nicely to the Oculus Rift. We playtested throughout the game jam, but bug fixes and last-minute tweaking and things breaking prevented us from working on other more important things (which were brought up over and over again by submission reviewers after we submitted). Iterate, iterate, iterate. Sometimes it’s hard to let a bad idea go! We talked through design features in a ruthlessly objective fashion. I love the logo, super fun to design, A++ would make again. Halfway through, we realized we didn’t have a story for why any of this was happening. 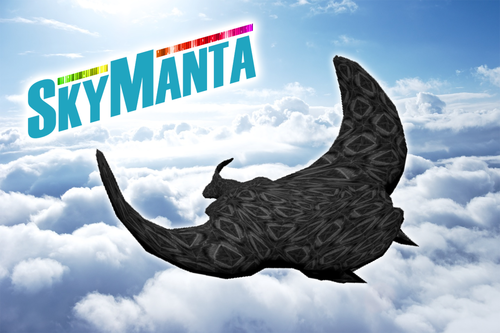 Who are you, little Sky Manta, and where did you come from? Sleep deprivation didn’t exactly come to the rescue on this one either — keep it silly, or make it serious? In the figurative 11th hour, we decided it was more important to nail one instead of do both poorly. Which one we chose to accomplish is left as an exercise to the reader. Probably don’t use game jams to learn how to do basic, major things like 3D modeling or rigging. Unless you’re ok with your project coming out like ours, which in that case shine on you crazy diamond. Sleep : good work :: caffeine : this game. The aiming was pretty universally annoying, so we tweaked the player character positioning and the angle of fire to dead center of the screen. The “pew pew” sound effect also got annoying fast, and we really should have replaced it before we submitted, but oh well. I’m glad people are finding it as fun to play as we intended! We ended up porting it to the Rift because Zite has one. It felt really cool to be inside of the world we had just created, the ocean looks awesome and somehow it just feels more natural to navigate the game world we made in the Rift as opposed to on PC, so if you have a Rift you should definitely try it out. Living on the edge as we all do, my game jam partner and I kicked off Ludum with three drinks and the sinking realization that maybe picking my bad idea to work on wasn’t such a great one: ocean meshes are hard. Somewhere around 6am, I went to sleep for a little bit so I could avoid the worst part of the hangover — your mouth is cotton, the world is vicious stabbing sunlight — and woke up to this.